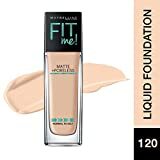 MAYBELLINE FIT ME MATTE FOUNDATION: For a natural looking medium coverage liquid foundation makeup, look no further. In 40 shades, you'll find a fit for every skin tone. Best for normal to oily skin; refines pores for a natural looking matte finish. A SHADE THAT FITS ME: Maybelline Fit Me liquid foundation provides coverage for a wide array of skin tones, from Ivory to Mocha. Use as a full face foundation with buildable coverage for a flawless, natural-looking, "I woke up like this" finish. MAYBELLINE FIT ME FOR A FLAWLESS FACE: With Matte + Poreless foundation or Dewy+ Smooth foundation with SPF 18, concealer, finishing powder, bronzer & blush, Maybelline New York Fit Me collection has everything you need to put your best face forward.